Volkswagen UK has opened the order books for its all-new Polo today, and has also released the first round of pricing. The sixth-generation car will be available from £13,855 OTR, and the range will expand to feature a seven-model range, including the 197bhp GTI and an enhanced-specification GTI+ trim. We’ve covered the main technological developments of the new car here, but with more passenger space thanks to being based on VW’s ‘MQB’ platform, a new range of engines, a sharper design, as well as myriad safety and enhanced infotainment systems, the latest Polo is a thoroughly modern update of Volkswagen’s perennially popular small car. How popular? Over 1.4 million Polos have found UK homes since the first-generation Polo arrived in 1975. Always a standard-setter, segment firsts this time around include the debut of digital instruments in a compact car, as well as a new level of assistance systems in the small car sector. These include Adaptive Cruise Control, Blind Spot Detection, City Emergency Braking, and Pedestrian Monitoring technologies. In a move which does away with the 6.5-inch units available in other markets, there are also eight-inch glass-encased colour infotainment systems standard across the whole of the UK new Polo range. The £13,855 1.0-litre S with 64bhp kicks off the UK range, the trims running S, SE, Beats, SEL, R-Line, GTI, and GTI+. The only prices released so far are those pertaining to the 1.0-litre MPI and TSI models, though we do know that the 1.5-litre ‘EVO’ engine with 147bhp and active cylinder management – which shuts down two cylinders under light load for increased efficiency and reduced emissions – will only be available in higher-specification R-Line trim. The lowest-priced diesel will be the SE 1.6-litre TDI with 79bhp, and both it and the more powerful 94bhp version have SCR catalytic converters. 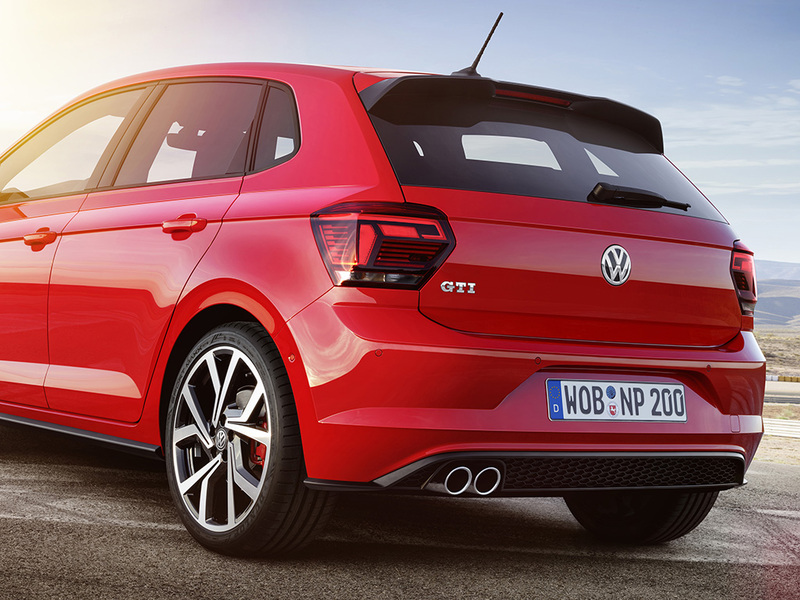 The range-topping GTI and GTI+ models are powered by a 2.0-litre TSI engine producing 197bhp, which comes from the ‘EA888’ engine series, higher output version of which also make an appearance in the Golf GTI, Golf GTI Performance and Golf R. All new Polos have a stop-start system and regenerative braking, while cars with an output of 94bhp upwards can be ordered with a six or seven-speed DSG gearbox as an option to the five or six-speed manual gearbox which comes as standard. Standard on both the GTI and GTI+, but a £115 option on other models, the Driving Profile Selection allows the choice of one of four programmes – ‘Eco’, ‘Sport’, ‘Normal’ and ‘Individual’ – which tailor the Polo’s character to the driver’s precise need and mood. In the ‘Eco’ driving mode, engine control, air conditioning and other auxiliary systems are regulated for optimal fuel efficiency. In DSG-equipped Polos, a coasting function can be used in the ‘Eco’ mode, while in ‘Sport’ mode, engine response and shift points of the DSG are configured to be more dynamic and, where fitted, tuning of the adjustable dampers is modified. With the first press drives complete and the car now in showrooms, the European advertising campaign for the new Volkswagen Polo was launched today. The primary focus will be on the sixth-generation car’s safety assistance and convenience systems, with the first press advertisement proclaiming ‘Your back-up when backing-up’, and promoting the Park Pilot and Park Assist functions. ‘As one of the world’s most advanced small cars, the new Polo calls the tune in its class when it comes to safety – something that is important to people. Our campaign highlights this subject in typical Volkswagen style: emotional, authentic and humorous’, said Jürgen Stackmann, Volkswagen Brand Board Member for Sales. According to Volkswagen, the new TV commercial, print materials and social media campaign will highlight how the new Polo ‘combines safety with adventure’. The ‘emotional’ aspect comes in the form of a father and son story illustrated in the TV commercial. The spot which shows how assistance systems ‘can enrich lives’, with the father’s unsuccessful attempts to assist his more adventurous son documented through time. But, when they are both in the new Polo, he can relax as the car will ‘assist’ his son, through its numerous safety systems which include a blind spot lane change monitor, as well as front and pedestrian monitors. The ‘360-degree’ campaign begins in over 30 European countries simultaneously. The print campaign will focus on modern convenience and safety technologies, while Volkswagen also states that the new Polo will also be the star of ‘entertaining’ feature films especially made for social media channels. The campaign has been devised by DDB Berlin, DDB Hamburg, and Adam&Eve DDB London. The new Polo’s ‘father and son’ one-minute TV spot can be seen at www.volkswagen.de. As well as the first public showings of the T-Roc SUV, the latest I.D. Crozz electric concept car, and the new Polo range in general, Volkswagen also chose the 2017 Frankfurt motor show (14-24 September) to debut the new Polo GTI. Although the 2018 version of the hot hatchback was shown at the new Polo’s global unveiling in Berlin on 16 June, its world premiere at IAA 2017 was the first time the car had been seen by a public audience, just as with the more mainstream models. As well as unveiling the car alongside the smaller Up GTI, more details of the latest performance Polo have also been revealed. Of course, the headlines are unchanged from the June new Polo launch: 197bhp (200PS) 2.0-litre turbocharged engine, 236lb ft (320Nm) of torque, a top speed of 147mph (237km/h), with sports suspension and Volkswagen’s XDS electronic differential lock as standard. The increase to 1,984cc means that the Polo GTI is in the 2.0-litre performance hatchback category for the first time, while maximum power is delivered between 4,400 and 6,000rpm. The EA888-derived unit’s maximum torque meanwhile can be accessed from as low as 1,500rpm. The car will also launch with a six-speed DSG gearbox (as with the 2010-2014 Polo GTI ‘6R’), but don’t fret: a six-speed manual will follow for all you cog-swappers. For those interested, emissions are 134g/km, 5g/km down on the outgoing 189bhp Polo GTI. Externally, the car looks every inch a GTI. 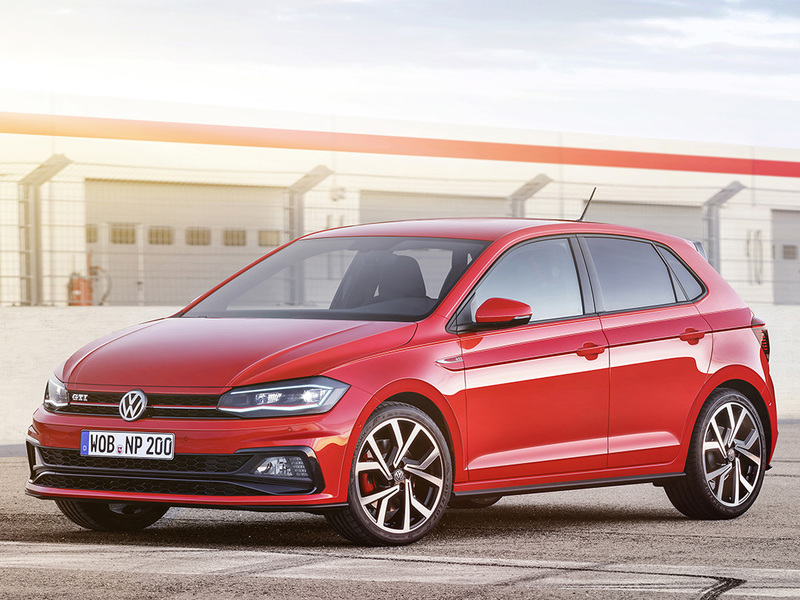 All the sub-brand’s signifiers which have identified go-faster VWs since 1976 are there: the ‘GTI’ badges, the red grille strip (which, as before, extends into the headlamps), honeycomb air intakes, while the 2018 Polo GTI also adopts key new Volkswagen styling trends such as the C-shaped gloss black lower front bumper sections which frame the integrated fog lights. 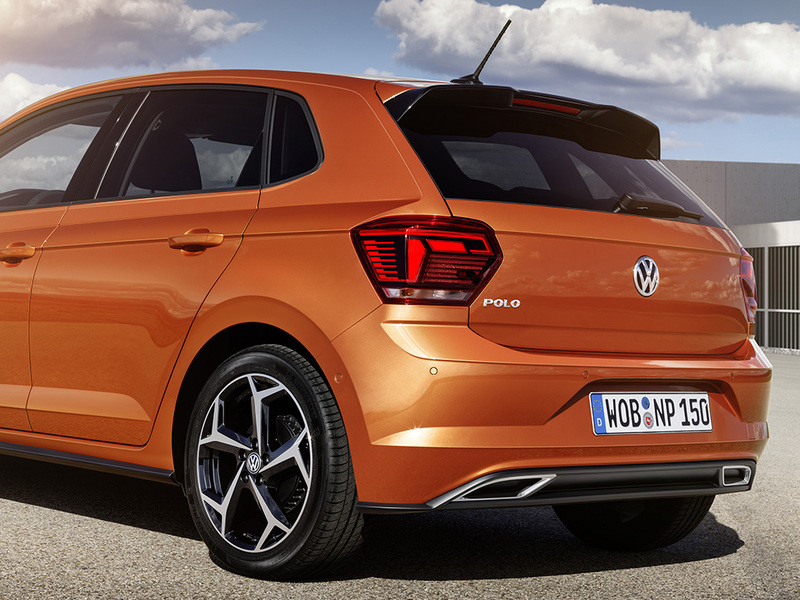 Selected versions of the new sixth-generation Volkswagen Polo will be fitted with Kuhmo tyres, it has been announced today. Designed for optimum fuel economy, the South Korean company’s Ecowing ES01 KH27 is now standard on Polos leaving the production lines in the Spanish Pamplona factory and wearing tyres of 185/65 R15 88H size. Kuhmo was already an approved tyre supplier to the fifth-generation Polo, too, but the KH27 has been developed to ‘meet the needs of compact and medium sized vehicles and is characterised by its notably low-rolling resistance’, which results in lower fuel consumption and rate of wear, as acknowledged by ADAC tyre tests (ADAC Motorwelt 03/2016). To find out more about Kuhmo’s full range of both road and track tyres, visit www.kuhmotyre.co.uk. After months of speculation, Volkswagen has unveiled the new sixth-generation Polo this morning in Berlin, and we are delighted to bring you first details. At first glance, the latest chapter in VW’s small car story doesn’t look that much different to its predecessor, and while it was always going to be evolution not revolution, there’s a great deal more going on under the new, more characterfully-sculpted skin. Let’s start with the looks. While the overall silhouette and shape is in no doubt similar to the outgoing fifth-generation car, the new five-door only sixth-generation Polo looks a lot sharper and distinctive thanks to more prominent surface detailing. More obvious flared rear shoulders lead into an arrow-shaped line down the side of the car, which Volkswagen calls the ‘tornado line’. Heavier lower door sculpting also breaks up the visual bulk on the side of the new Polo, while a more complex front bumper design features more structured elements. A bonnet ‘beak’ extends into the front grille, while the headlights cut through the same line as the bumper join, giving them a pointed appearance as they extend rearwards. The twin-grooved bonnet is also a great deal more curved than before. Due to the more stretched dimensions of the smallest ‘A0’ version of the Volkswagen Group’s Modular Transverse Matrix (‘MQB’) platform and wider 1,525mm front and 1,505mm rear tracks, the wheels of the new Polo are pushed further into the corners, which, along with shorter front and rear overhangs, gives it a more dynamic stance. 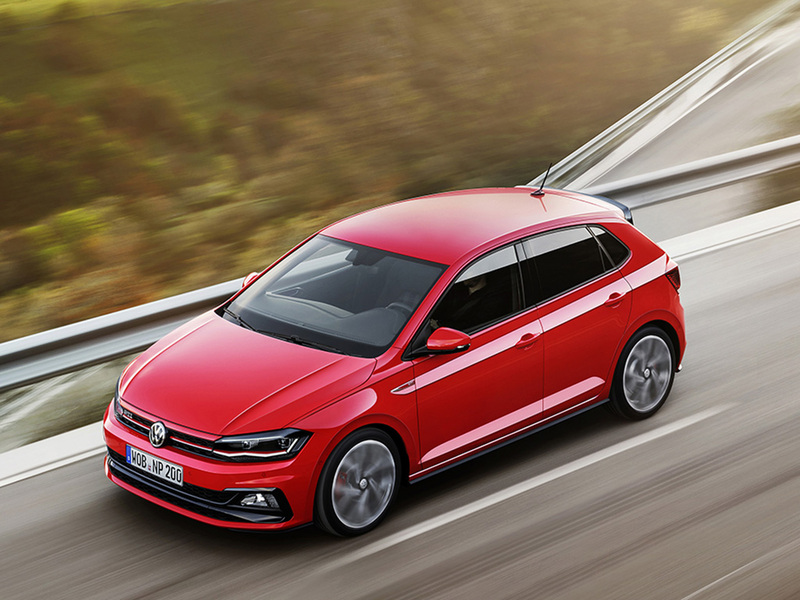 The wheelbase has increased by 94mm to 2,564mm, while a 4,053mm length sees the sixth-generation car become the largest Polo ever. Width is up 69mm at 1,751mm. Luggage space has increased by an amazing 70 litres – 25 per cent – to 351 litres. The interior of the new Polo takes recent Volkswagen concept car themes and transfers them to a production model. A horizontal design differs from the current fifth-generation car, and sharp geometric shapes lend a more futuristic appearance, helped by digitised technology. The instruments and touchscreen blend into one another, framed by a new dashpad similar to the smaller Up, which can also be personalised with 13 colours. 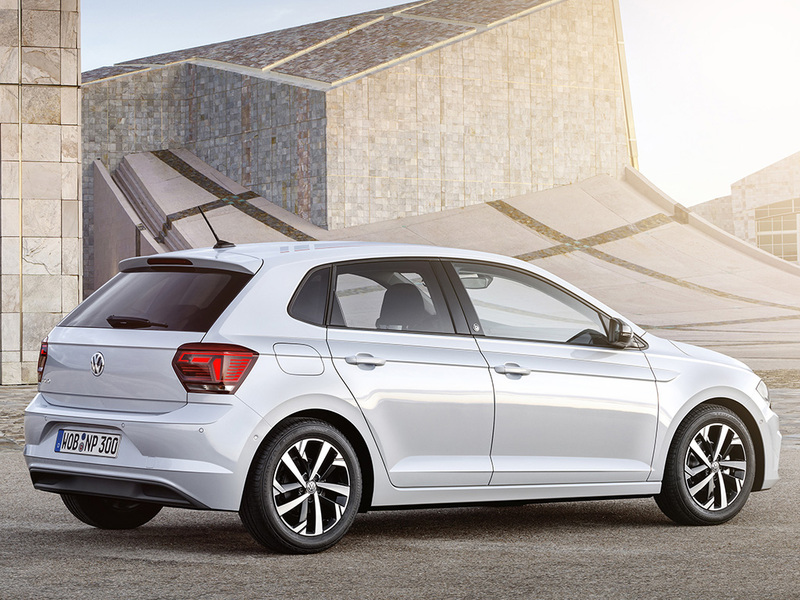 The all-new Polo also premieres Volkswagen’s new generation of infotainment systems. Using glass-covered surfaces and more digital operation than before, even the entry-level new Polo gets the Composition Colour infotainment system with a 6.5-inch display as standard. And while not as large as the 9.2-inch version on the recently revised Golf, an 8.0-inch touchscreen will also be available. The optional new generation of Volkswagen’s Active Info Display digital instruments is a small car first. With more information, a more logical structure, and even more graphic clarity, operation is easier, too, with just one steering wheel-mounted button used to activate different graphic menus. A total of nine Euro 6 engines (six petrol, two diesel, and one natural gas) are available for the new Polo. A three-cylinder 64bhp 1.0 TSI kicks off the range allied to a five-speed gearbox. A trio of 1.0 TSI engines with 74, 94 and 113bhp bolster the entry-level unit, while a new 1.5-litre 148bhp ‘Evo’ engine with cylinder deactivation – as seen on the recently-revised Golf 7.5’ also features. Top of the new Polo tree is a hot 197bhp GTI model – the hottest series production Polo ever if you discount the 2013 Polo R WRC limited edition – which can be had with both a six-speed manual or seven-speed DSG gearbox. The dual-clutch shifter can also be specified on the 94 and 113bhp 1.0s, as well as the 148bhp 1.5. In a Polo first (but not for the UK) is a new 1.0-litre TGI natural gas engine. Developing 88bhp with a five-speed gearbox, the Polo TGI can, Volkswagen states, be CO2-neutral, depending on the energy source it is refuelled from. A brace of 1.6-litre diesels with 79 and 94bhp round out the range for now. Both are mated to a five-speed manual gearbox, with the more powerful unit available with the seven-speed DSG gearbox, too. Rumoured electric and hybrid versions of the new car will not appear, Volkswagen citing a lack of market demand and non-recoverable high development costs as the reasons why. Emissions are also thought to be at their lowest in small cars anyway, according to the company. At launch, Volkswagen is only quoting specifications for continental markets only, so for the UK market, we’ll have to await further details. Going by these first details, though, the range will be very comprehensive. Entry-level Trendline models have LED daytime running lights, a Front Assist area monitoring system with City Emergency Braking and Pedestrian Monitoring, as well as 14-inch wheels. In Germany, prices will start at 12,975 euros, and this offers more value than before. 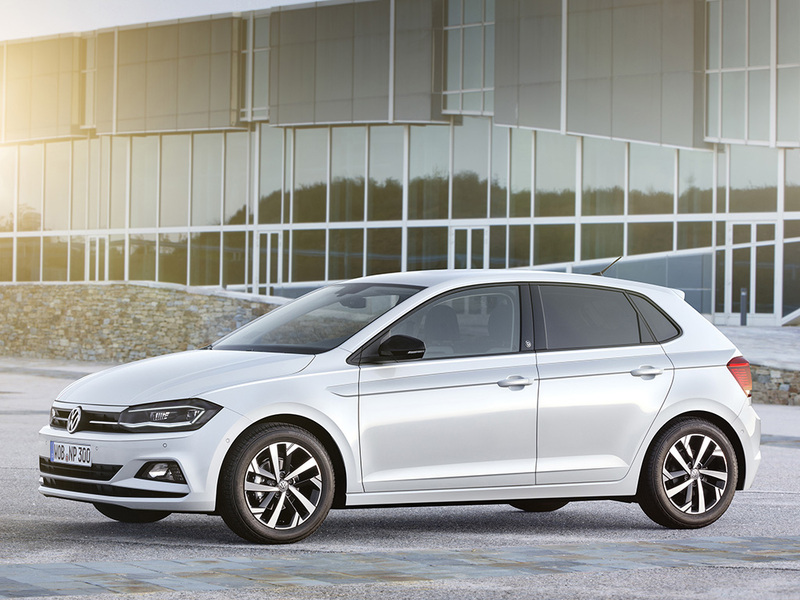 Move up to Comfortline spec, and new sixth-generation Polo drivers gain 15-inch wheels, a Composition Colour infotainment system, Climatic air conditioning, a Driver Alert system, front and rear electric windows, ’knitted velvet’ seat covers (! ), and a multi-function steering wheel. A Park Distance Control safety system is standard on Highline models, along with white ambient front door and instrument LED back lighting, a leather-covered gear knob and handbrake handle, as well as 15-inch ‘Salou’ alloy wheels. Just as with the current car, the Beats model has a 300-watt Beats Audio sound system. There are also 16-inch alloy wheels, black mirror caps, bonnet and roof decals, and ‘Beats’ badges on the B-pillars. Inside a ‘Velvet Red’ dashpad and sport seats add distinctive flourishes, while the 300-watt sound system can be ordered as an option on other models. We’re surprised this has been announced from the off, but a new 2.0-litre, 197bhp GTI rounds out the new sixth-generation Polo range. While power isn’t up that much on the current 189bhp model, the car borrows the Golf GTI’s engine and has a standard ‘sport chassis’ as standard. A ‘Sport Select’ chassis with adjustable dampers will be optional, while a unique front bumper with integrated fog lights, gloss black trim and a lower lip spoiler help the new muscular-looking GTI stand out. Now a modern GTI tradition, the front grille’s red trim is carried though into the headlights, while traditional honeycomb elements and a ‘GTI’ grille badge also feature. At the rear, the new power-Polo gets twin chrome tailpipes, LED tail lights, a ‘GTI’ badge, and a high-gloss black rear roof spoiler. 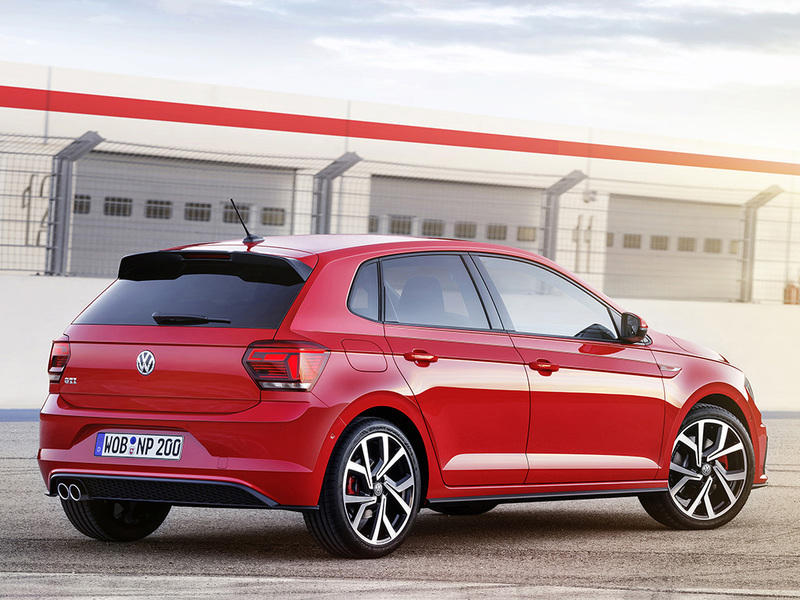 Side sill extensions and red brake calipers display the new Polo GTI’s credentials in profile view. Inside there’s the now mandatory ‘Clark’ check upholstery, leather-trimmed multifunction steering wheel, black headlining and ‘GTI’ gear knob. When it comes to wheels, 17-inch rims are standard, with 18-inchers an option. An optional R-Line package (the orange car in our pictures) with ’Sebring’ 16-inch alloy wheels, a sports front bumper, a rear diffuser and spoiler, and black sill trims is also available. Elsewhere, the new Polo is the most personalised Polo ever. A total of 14 exterior colours can be matched to 13 dashpad colours, and twelve wheels (from 14 to 18-inches in size), two interior trims and a total of 11 seat cover designs mean the Polo can be personalised more than ever before. New high-tech options include wireless smartphone charging, LED headlights, an ‘Air Care Cimatronic’ system with air quality sensor and allergen filter and a panoramic sunroof. A ‘Sport Select’ system adds adjustable dampers, while Adaptive Cruise Control (ACC) is just one ‘big-car’ option. We’ll bring you more details of the this exciting new chapter of the Polo’s story as we get them, but this first details point to the most technologically-advanced as well as one of the best-looking Polos to date. UK specifications and overall prices still have to be released, but are predicted to be only slightly more than the current car’s £11,970 starting price. UK order books are expected to open in October, with first deliveries in January 2018.